Katie had an idea. Her son was building knives as a hobby but didn't have a good way to create and make a unique mark on each of his custom creations. Katie found Caitlin Lawless, an art student that helped her created a cool logo, but then she was stuck. 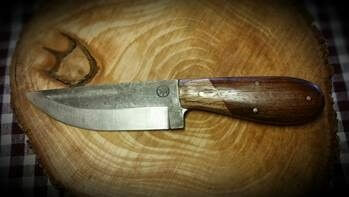 "I had no idea how to find a method to take the logo we had and turn it into a permanent mark on the knife. I started to Google search and found a few marking companies. One stamp company said they made stamps which did not help me much since I had no idea what I really needed. 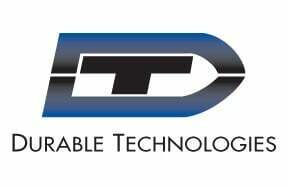 Then I talked to Matt Martin at Durable Technologies. Matt was amazing. He took his time walking me through the process of choosing the right stamp type: including the right stamp material to mark Jackson's knives, what stamps were appropriate for the volume of knives we were making, also the best way to get a good design onto the stamp. I sent Matt a picture of the logo and Matt told us that it was a good candidate for a custom hand stamp. We also needed the stamp delivered in less than four weeks so it would be ready for Christmas. Durable delivered with time to spare. Matt even called us after New Year's to find out how the stamp was working and if we were happy with it. It had been a long time since I have seen this type of customer service," says Mrs. Bradds. Jackson is now building enough custom knives and creating enough demand for them that he's selling his creations to retail stores throughout the Smokey Mountains and turning his hobby into a small business. Congratulations, Jackson!! 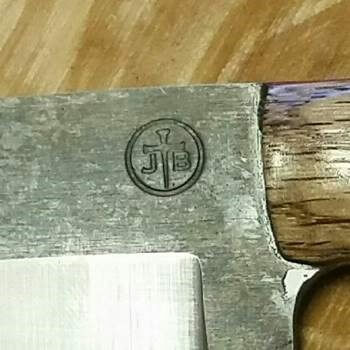 The stamp Durable Technologies made for Jackson was a custom steel hand stamp with 3/8” diameter sharp face copy made from shock resistant steel. Durable Technologies' custom made steel hand stamps are manufactured according to your specifications, using heavy duty steel that provides extra long service life. Made from a special grade of shock resistant tool steel, they resist spalling and mushrooming. Marking Hammers designed to maximize effectiveness when striking stamp. Steel Hand Stamp Holders to protect operator from injury. This post was published on January 31, 2017 and updated on February 28, 2019.